An overturned semi in the northbound lanes of the Tri-State Tollwaynear 115th Street Monday morning. 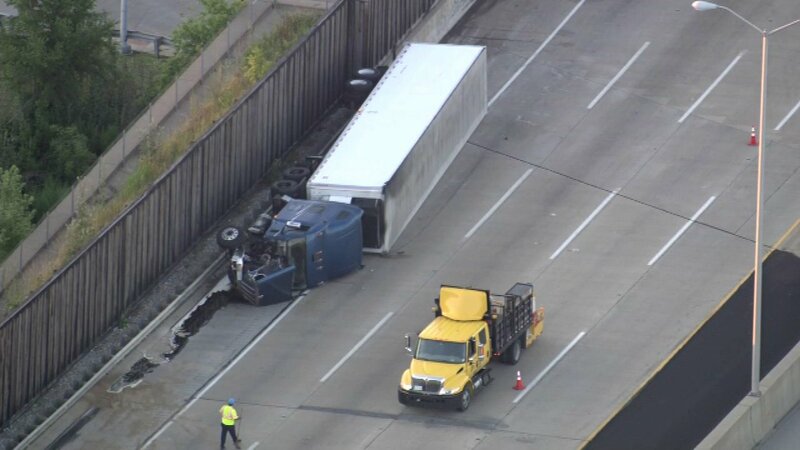 ALSIP, Ill. (WLS) -- One person was killed and three others injured after a crash involving a semi-truck on the Tri-State Tollway in Alsip Monday morning, Illinois State Police said. The crash occurred in the northbound lanes of the Tri-State near 115th Street at about 4:40 a.m., police said. A semi-truck rear-ended a car, causing the car to catch fire and the semi to overturn. The driver of the car was unable to escape the vehicle and was pronounced dead at the scene, police said. Two passengers in the car were hospitalized with non-life threatening injuries and the driver of the truck was transported with minor injuries. The driver has been identified to the Cook County Medical Examiner's Office as Brian Gibson of Atlanta, Ga.